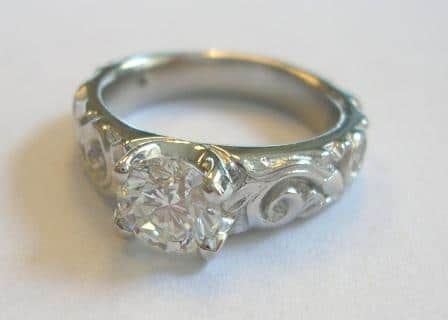 This interesting design that was forged in precious platinum was a collaborative effort of K. Alan Smith, my client, and my longtime designer friend Alishan. The logistics of this collaboration were uniquely challenging as my clients reside in London. Yes, England! Their wishes in a ring design were for something structurally strong, but yet possessing meaningful flow lines. We accomplished this with this lovely Alishan design that was modified and customized to specific millimeter width and contour to perfectly and proportionately rest on her finger. And oh, how it presents that incredible diamond! As we incorporate all the modern marvels of technology into our design studio, challenges are addressed and pushed aside! From the simpler use of email and texting, to the new state of the art CAD design programs we use, it all is applied. A good old fashioned phone call even has tremendous benefit. Always nice to hear a voice! So, from London – Tokyo – Paris – Seattle – Mukilteo, K. Alan Smith can make your dreams come true. Go ahead, give a call.